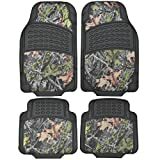 BDK camouflage 4 piece floor mat durable, fit, trimmable – BDK guarantee don’t head into the woods without proper Camo gear. Keep your interior safe from damaging dust, dirt, dander and the wear your car faces from daily use. We provide the highest quality in the competitive market the BDK Camo floor mats are designed with your auto care in mind. The uniquely constructed linear and diagonal ridges are placed strategically to maximize the dirt trapping capabilities of the mat. They are constructed of the highest quality of rubber polymer. A perfect buy for the perfect vehicle All weather design – traps loose dirt, mud and water durable – treated with BDK max fabric to resistant to water, UV, rot and etc. Trimmable to fit – 500 trimmable patterns easy to clean (just spray some water) 2 year limited warranty by manufacturer. Don’t head into the woods without proper camo gear. The BDK Camo floor mats are designed with your auto care in mind. The uniquely constructed linear and diagonal ridges are placed strategically to maximize the dirt trapping capabilities of the mat. They are constructed of the highest quality of rubber polymer. A perfect buy for the perfect vehicle! Durable – treated with BDK MAX fabric to resistant to water, UV, rot and etc.